African Union Commission mourns Winnie Mandela; eulogizes her as a mother and pride of Africa. Addis Ababa, Ethiopia, 4th April 2018; The African Union Commission Deputy Chairperson H.E Ambassador Kwesi Quartey led the AU Commission to pay tribute to the late Nomzano Winnie Madikizela-Mandela, eulogizing her as a woman of incredible Strength, pride, love, determination and a woman who was able to keep alive the torch of freedom despite years of torture, harassment and hardship. 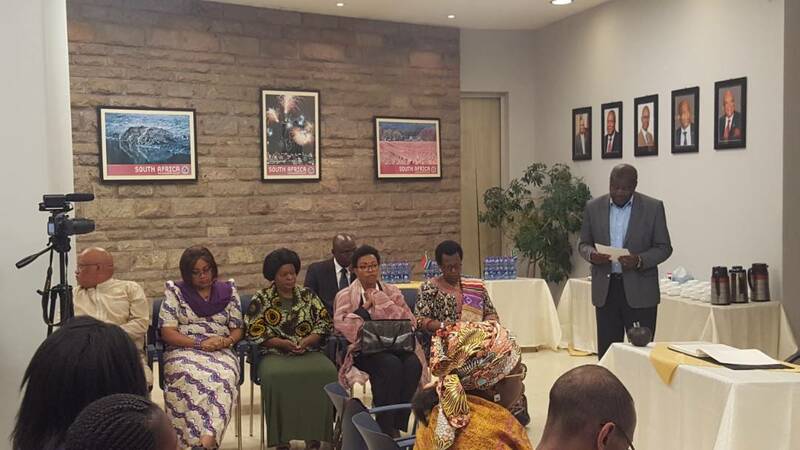 The African Union Commission joined Ambassadors in Addis Ababa, Ethiopia at the South African Embassy. The Deputy Chairperson stated that Winnie will continue to be a source of inspiration as she leaves a sustainable legacy for future generations. “Our hearts are heavy for the loss of this pride daughter of our beautiful continent. However, we know that she would have wanted us to celebrate her life. She played a key role in ending Apartheid and shaping the history and destiny of her country, our continent and the world. A life that made us conscious of our duties to Africa,” stated Amb. Kwesi. Read the full statement of the tribute below. This morning our Chairperson, H.E Moussa Faki Mahamat paid his respects on our behalf to the family, the people of South Africa and the African National Congress at the Mandela family home in Orlando Soweto. His visit follows the communique that he issued on 2 April following the announcement of the untimely passing away of Mama Nomzano Winnie Madikizela Mandela, one of Africa’s fallen heroes. This is a time of grief for Africa and her Diaspora and it is therefore with a great deal of emotion that I stand before you today, on behalf of the AUC Chairperson and AU Commission, to pay tribute to Nomzano Winnie Madikizela-Mandela, a woman of incredible strength, pride, love, determination and a woman who was able to keep alive the torch of freedom despite years of torture, harassment and hardship. Our hearts are heavy for the loss of this pride daughter of our beautiful continent. But we know that she would have wanted us to celebrate her life. One vital to the ending Apartheid and shaping the history and destiny of her country, our continent and the world. A life that made us conscious of our duties to Africa. Mama Winnie, you became a household name and the symbol of our continent’s unwavering will to achieve self-determination, resist oppression and take our destiny in our own hands. You inspired millions of Africans across the continent and the light in your eyes was a compass of hope for women and girls. Your warm smile and unparalleled beauty were reverberations of the unique gifts our continent has been endowed with. Sisters and brother gathered here today, H.E the Chairperson of the AUC stated in his obituary on Monday April 2nd: “Nomzano WinnieMadikizela-Mandela paved the way for women in the struggle to end apartheid and fought relentlessly for their rights and welfare in her country”. However, I have no doubt that she will continue to be a source of inspiration for millions of people and that she will leave a sustainable legacy for future generations. As such, even if the loss we all feel today is vast, we must not forget that she will forever remain alive in our hearts, she will remain the voice telling us that we must not give up in the face of adversity. She will forever live through the lives of every African citizen whose greatest wish is self-determination and prosperity for our continent. She was the “movement”. As a Commission, we are proud to have been associated with your life and the Lifetime Achievement Award that was given to her and received by her granddaughter Ms. Gandhi in January 2017 during the Gender Pre-Summit is a testimony of our greatest respect and admiration for her. She is and will remain the mother of the Nation and the Pride of Africa! On behalf of the African Union Commission, I send my heartfelt condolences to her family, to the people of South Africa and to all Africans.